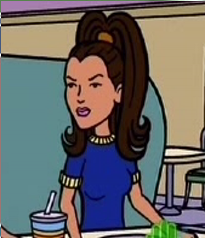 Nicky or Nikki is one of the Lawndale High School cheerleaders, specifically the one with dark brown hair in a beehive style. In "Daria Dance Party", where she and the rest of the time swore an oath not to date Kevin, she was seen at the dance snogging a blond Lawndale Lions player. In "The F Word", where she gains a voice and name, she remarks how it's great when the teachers come out to support the team - "God, I hope they don't talk to us" - and thinks it's normal for Brittany to literally get lost or confused about who she is. She is a recurring figure as she's one of the few non-Brittany cheerleaders we know the names of. Her personality and role varies, though she's usually presented as popular and (as in the show) buddies with Britt. In the Turnabout Confusion series, she is part of the cheerleaders 'faction' following the lead of Dawn Wilkins in waging social warfare. In Lawndale Fighting Championship, she was given the surname Dowling.